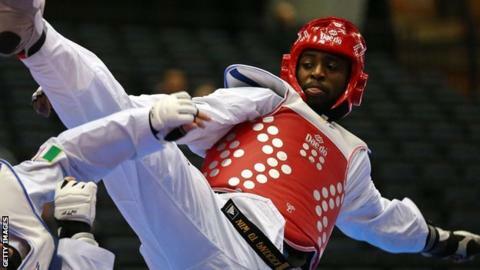 British taekwondo fighter Mahama Cho has secured a place for Team GB at the Rio Olympics in the +80kg category. The 26-year-old defeated Carlo Molfetta, the 2012 gold medallist, to reach the final of the European Olympic qualification tournament in Istanbul. Great Britain have already secured places via Jade Jones, Bianca Walkden and Lutalo Muhammad. With a maximum of four berths on offer, Great Britain cannot qualify any more athletes via the European qualifiers. Although Cho, like Jones, Walken and Muhammad, is the leading candidate in his respective category, GB Taekwondo will not select their fighters until nearer the Games. "It feels absolutely fantastic. Now the real work starts," said Cho. The European Championships in Montreux, Switzerland, 19-22 May is likely to be the final opportunity for fighters to prove their credentials.